This web exhibit is intended to generate interest about the life and journeys of Samuel de Champlain, as well as opportunities for further discussion and activities in the classroom. Have students prepare in written or visual format an interpretation of an imagined or real place they are encountering for the first time. What kinds of characteristics might they identify? What descriptive tools might they use? How might their personal experiences shape this interpretation? Ask students to prepare, on the basis of the information provided in this web exhibit, a research question about Samuel de Champlain that they would like to explore further. Ask them to include a description of how they might go about answering this question. What research tools might they use? This activity can be completed individually or in groups. Ask students to choose a particular artist or scholar discussed in this exhibit and to prepare a brief written, oral or visual presentation about this person’s perspective on the life and journeys of Samuel de Champlain. Encourage students to explore and review one or two additional pieces of work by their chosen individual. This activity can be completed individually or in groups. Have students prepare a detailed map of a real or imagined place that they are encountering for the first time. What sort of details might they include? 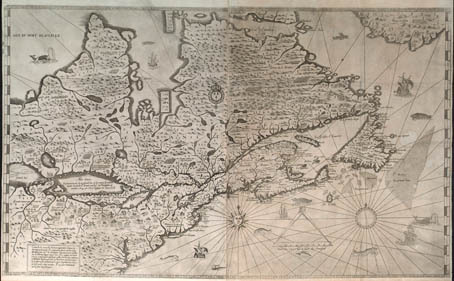 How might these maps differ from the ones prepared by Champlain on his journeys? This activity can be completed individually or in groups. What stories and perspectives have added to our understanding of Samuel de Champlain over time? How have perspectives about Samuel de Champlain contributed to the development of Canada’s broader historical narrative? How have these perspectives contributed to changes and re-examinations of this historical narrative over time? What do these perspectives teach us about the importance of taking a critical approach to historical writing and scholarship? What tools and resources can we use to critically evaluate historical writing and scholarship? What tools and resources can we use to help us with our own historical research and writing? 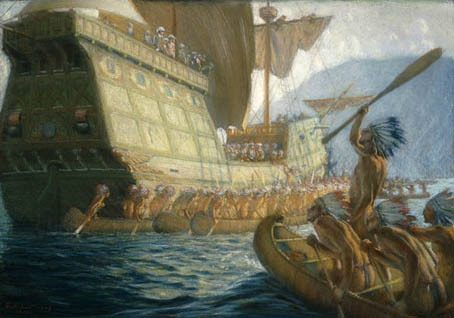 How is Champlain represented in these works of art? How would you describe him? How are Aboriginal people represented in these works of art? 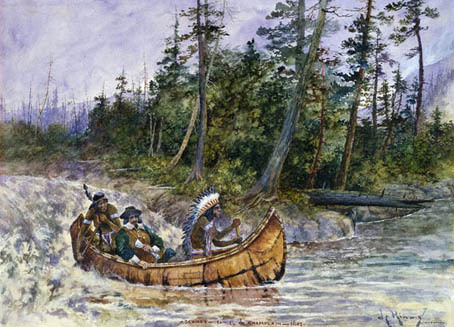 How is Champlain positioned in relation to the Aboriginal people in these images? What kind of clothing is he wearing? What types of objects are in the picture with him? What do these objects tell us about Champlain and the time period in which he lived? How is the physical landscape presented? How do these works of art tell the story of Champlain’s role in Canadian history? How does this art promote a distinctly Canadian national identity? 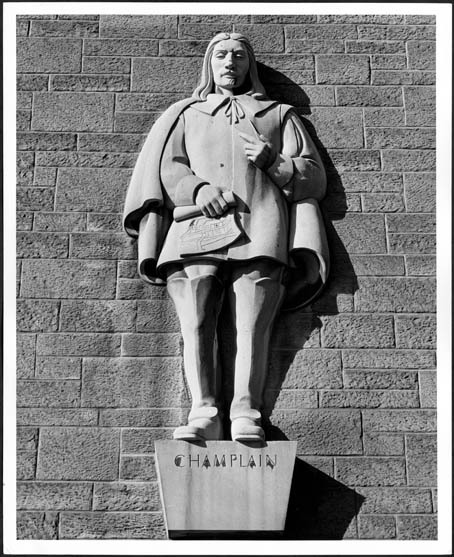 How do these monuments represent Champlain? How would you describe him? How do these monuments tell the story of Champlain’s role in Canadian history? What do they tell us about the time period in which they were created? What values and ideas do they reflect? What values and ideas might be reflected in a statue of Samuel de Champlain created today? What would it look like?